January's One-Page Adventure, The Chasm of Crasmere, is now available for Tunnels & Trolls! The format is a bit, meh, but I'm still trying to get the "right" InDesign template created for T&T One-Page Adventures. It would also help if I was using something that wasn't still running Windows XP. The featured monster, Daughter of Ogrin, was created through the random tables in Matt Finch's Tome of Adventure Design. The interesting thing with using that book is that it is designed to be used with the more D&D like RPGs (mainly Swords & Wizardry). But with the simplicity of Tunnels & Trolls it was fairly easy to adapt the creation to fit the flavor of Tunnels & Trolls. Music is often an inspiration for a lot of GMs and players at the gaming table. Whether it is a character idea, adventure plot, npc, item, monster or whatever. Even my first One-Page Adventure, The Tower of Skulls, was inspired by music. This is the first of a series called: RPG and Music Pairing. And we are kicking it off with a fresh slice of Slashers & Victims Light with a pint of Uncle Acid & the Deadbeats. Slashers & Victims Light is a 1970s/80s slasher horror movie hack of Swords & Wizardry Light. Uncle Acid & the Deadbeats is a Psychedelic "Psycho Rock/Crime Wave" band. This is probably the best pairing you will find for a slasher/horror RPG! Now, to be specific here I want to highlight the album, The Night Creeper* by Uncle Acid & the Deadbeats. When you get your gaming group together you will want to get your copy of The Night Creeper out and Patrick Bateman'splain why this album incorporates everything about Slashers & Victims Light. Before you begin, press play, and then discuss the rules of the game and begin character creation. Track 1: Waiting for Blood "There's a man who's just been waiting here all night long as he watches you he's smiling there all alone. He needs something better but he knows you're on your own." Track 2: Murder Nights "I don't want to know your name, I'll cut your throat all the same." Track 6: Melody Lane "I saw her dance when she first hit the scene. Creep joint romancing with amphetamines but tramps like me stay in shadows unseen. I want her." Track 7: The Night Creeper "Lock up your windows and bolt up your doors. Heed all the warnings he's coming for more. Innocent eyes are not what they seem. Strangers are dangerous, they'll hide all your screams." Track 8: Inside "Am I evil? You know I am. Will I deceive you? You know I can." So do yourself a favor and pick up your copy of Slashers & Victims Light and The Night Creeper by Uncle Acid & the Deadbeats. *The above Amazon link is an affiliate link. January's One-Page Adventure is here! This OPA is designed to be used with Swords & Wizardry Continual Light. Also, as a reference you would need a copy of Tome of Horrors Light, Volume 1 (Free!). Crasmere? That's right! The adventurers are back in the village of Crasmere! If you're not familiar with Crasmere it is the setting for the OPA, The Siege of Crasmere. Crasmere is to be used as a starting hub for your Swords & Wizardry Light and Continual Light adventures. Also, you can run this adventure without needing to run The Siege of Crasmere. As part of the Twelve Months of Tome of Adventure Design I created the featured monster, Daughter of Ogrin, using Method 2 in the Book 2 - Monsters chapter. Sadly, I can't find my actual dice results for this monster. I wrote them down on paper and then just typed out the results. I do know that it came up with two attacks, Head (bite-fangs), Body (enfolds and suffocates) and two special attacks. Though, with the Body attack I combined that with one of the special attacks. And the other special attack came up with Squirt Liquid - single target (immobilize). And for the Special Defense the result was Transform self to energy form (fire, lava, heat). Next month I will remember to have all the results for those that have the book. Notice: This One-Page Adventure is actually a 2-page PDF. The reason for that is I am trying to get more "professional" with these things. The second page has the OGL on the bottom half of the page and the top half is graphing paper for GMs to use. For 2018 I am going to be utilizing Matt Finch's Tome of Adventure Design for my One-Page Adventures. During the holiday season I received two physical copies of this book and so I gave one to my daughter for her to use. So after she received her copy I was able to sit down and look through my copy of this book. And I love it! I'm a huge fan of random tables and anything that adds randomness to a game that no one is expecting (including the GM). And this book is just full of tables and tables and tables and tables and etc. There's a lot of tables! This massive book is divided up into four mini books. So what this means for my One-Page Adventures is that I will use this book each month to help with creating my One-Page Adventures for 2018. I played around with Book 2 - Monsters some and here is an example of a monster that was created using Method 1. I believe there was a total of 7 tables I had to roll on. And I will now use a random name generator to give this monster a name. Bomul dwells within the abandoned mines of Ghunzle. Given that she is in mist form she could expand throughout the entire mines if she chooses. She has a powerful Giant Bat (Greater), Nil, as her companion. She can summon and command a mist that isn't part of her mist form. She can cause a creature to have a protective adoration for an object that's in their hand. Also, she can summon a swarm of bats at her command. Upon her death the mist form dissipates and what remains is a female creature that no eye has ever seen. Items: Bat Ring of Swarming - Wearing this ring allows the owner to summon and command a swarm of bats (if not in a cave-like structure then it can only be used at night). Rirthrar's Necklace - Whenever anyone puts this necklace around their neck the spirit of Rirthrar will attempt to possess the creature. If successful the creature will lose it's natural form and turn into a mist form creature. I was able to create the idea of Bomul just through the random tables that took not even five minutes to roll on. It gave me a skeletal structure that I was able to flesh out (as I wrote this blog post). So this is just an example of what kind of monster you could get from using the tables in the Tome of Adventure Design. For the first post of 2018 I would like to put the Spotlight on Deven Rue Cartography & Illustrations. 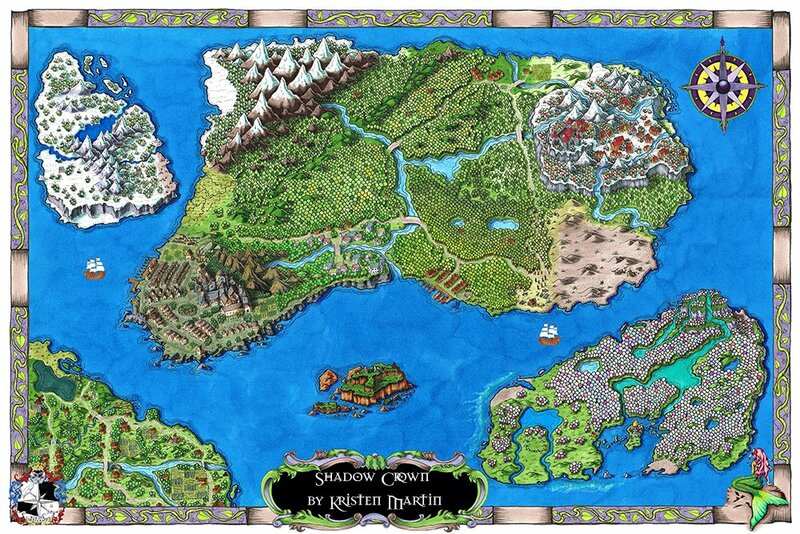 I'm sure some of you are familiar with these beautifully hand-drawn maps by Deven Rue. If not, well then you are in for a real treat! Did I mention that the maps are hand-drawn? Just look at that! Amazing isn't it? Here is a recent video, FOUND HERE, of a hand-drawn map of Tal'Dorei, the campaign setting for Critical Role. The reason for this Spotlight is obvious; the artwork is gorgeous. And I would like to see more of Deven Rue's work being used in OSR products. And I know there are some OSR publishers out there that would definitely be interested in this quality of work! There are also illustrations other than maps such as Tavern Signs that you can also get commission work for. Where can you find Deven Rue? I highly encourage you to look more into Deven Rue's artwork and consider becoming a Patron, a membership or even commission work! Also, there is merchandise.